In a constituency that has been ruled by the Peoples National Party (PNP) for over 30 years, the Jamaica Labour Party (JLP) candidate, Annmarie Vaz created a stunning turnaround to defeat the Peoples National Party candidate, Damion Crawford, by a hurtful 306 vote yesterday, April 4. When the initial count was completed, Ms Vaz polled 9,917 votes to Mr. Crawfords' 9,611, which is said to be the biggest turnout in the history of elections in that constituency. From the outset, it appeared it would be a closely contested election, despite the political pollsters predicting a close Vaz victory. But the PNP's Damion Crawford was always confident that he had the ground support he needed in a seat that was considered a safe PNP seat. 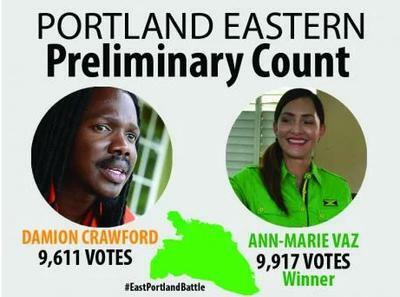 The majority of East Portland voter have clearly bought the proposition of Ann's #ActionAnn over Crawford's #ForwardWithCrawford though. She will we be the first female member of parliament in the constituency. Meanwhile, when asked about the future of Damion Secretary, Julian Robinson indicated that Mr. Crawford and the PNP made a valiant effort as Mr. Crawford came into this constituency just over 4 week against Ms Vaz who has been working there actively for over 3 years. Dr. Chang, Secretary of the Jamaica Labour Party associated the JLP win to Mrs Vaz dedication and on the ground work in the constituency. The voter turnout which was over 53% is much higher than any other bi election. It was the largest voter turnout by both parties in that constituency according to the pollster Don Anderson. The Jamaica Labour Party celebrations will continue for a long while in East Portland.